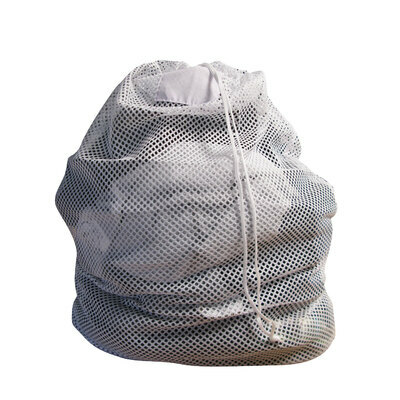 Designed specifically for environments that deal with high levels of washing on a weekly basis, our Mesh Laundry Bag has been manufactured to last. Using a high tension and strong 100% polyester construction, each bag can be drawn together with a simple drawstring to allow for contained and hygienic transportation of soiled linen. The drawstring toggle has also been manufactured from a highly durable POM plastic which can easily withstands the high temperatures found within washing machines - allowing you to deposit the bag in it's entirety within your load. Each laundry bag comes with an ID patch to help identify the owners of it's contents and help with identification once the load has been completed. While you're here, make sure to stock up on essential laundry items from our Gompels Bio Laundry Liquid 10l through to our Gompels Professional Fabric Softener 2 x 5l - all available here at exceptional wholesale prices.